You'll see I'm adding more wildlife and terrain detail. I've added a few grouse, two brook trout, and two deer in the background. I'll be adding some bugs and other elements to fill out the painting. When I actually began this painting, I had done a small watercolor of it to lock down a vivid color scheme to hold myself to. 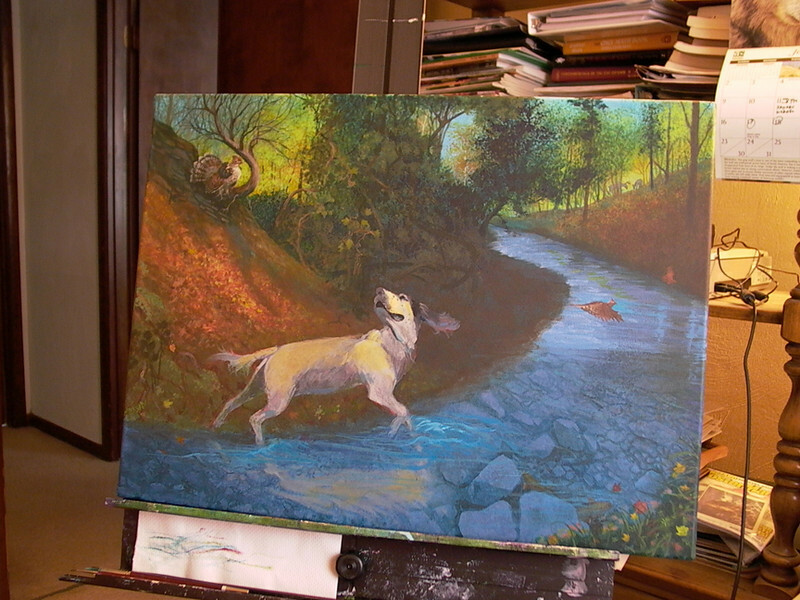 Both with this painting and the one of 'Brandie' the black lab, I wanted richness and 'fun'. I realize that these two beautiful species of animals are bred for hunting, but when you see someone or some creature in its most happiest state of being, well.....isn't it just delightful ? Inspiring, joyful ? Wouldn't you just love to be able to give that to the people and animals that you care for ? I feel quite honored to be able to create a 'haven' or 'heaven' for Scotchie. While I dwell on what to name this art piece, the words 'haven' and 'heaven' keep coming up, so perhaps: 'Grouse Haven' or 'Heaven' ....or 'Scotchie's Haven'.